Norinco designed the ZLC2000 in the late 1990s to enhance the operational capabilities of the PLA’s (Peoples Liberation Army) airborne forces. The first prototype was delivered sometime between 2000 & 2003 and was operational by 2005 (it was seen in airborne exercises). The ZLC2000 is air droppable, using multiple parachutes and this system was ready by 2004. 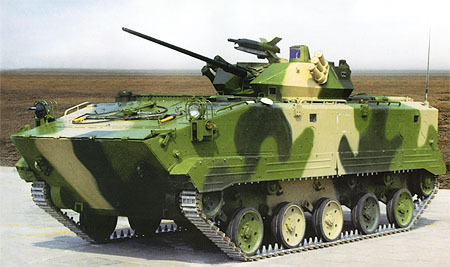 It is armed with a Chinese built 30mm cannon (not the Russian one as some people have speculated). The cannon is mounted in a one man turret located at the centre of the hull roof. A turret mounted ATGW launcher is also fitted; secondary armament is a coaxial 7.62 MG. The armour is very thin to make the vehicle as light as possible, as dictated by its air dropping capability. The ZLC2000 has a crew of 3 and the troop compartment has room for 5 passengers. The engine is an air cooled diesel (details not available) and the vehicle is fully amphibious, driven in the water by its tracks. Suspension is of the hydro-pneumatic variety and during air dropping, the tracks are retracted to its minimum position. When being air dropped, the crew and passengers jump separately from the passenger hatches of the transporter aircraft. The usual variants have also been built, i.e. a commander and control vehicle and an ATGW carrier vehicle.